For the first time since 2010, the average asking rent for Class A office space in San Francisco’s Central Business District has declined versus the quarter before, slipping 0.9 percent to $70.64 per square foot in the first quarter of the year. 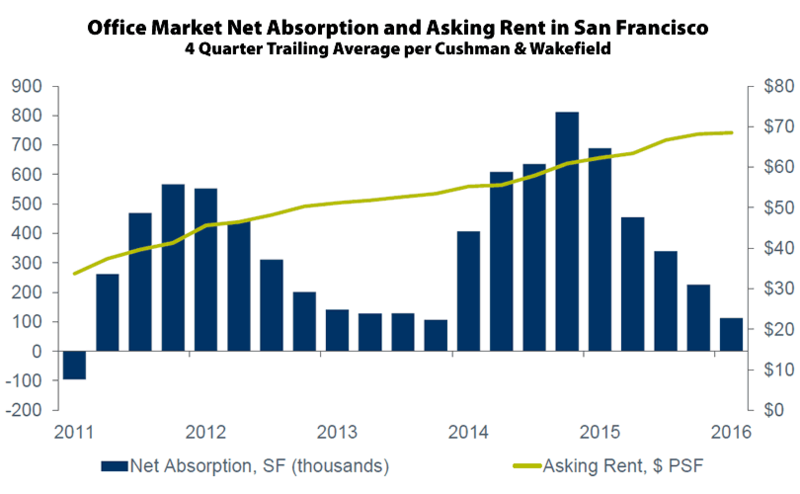 That being said, including Class B space, the overall asking rent for office space across San Francisco did hit a record $68.44 per square foot in the first quarter, up $0.30 per square foot (0.4 percent) from the end of last year, according to data from Cushman & Wakefield. At the same time, new leasing activity in the first quarter of 2016 totaled 1.1 million square feet versus 2.2 million square feet in the first quarter of 2015, and “active tenant requirements” fell from 5.2 million square feet in the fourth quarter of 2015 to 4.6 million square feet today, down from 6.5 million square feet at the same time last year. And in terms of supply, there is 4.3 million square feet of vacant office space in the city (822,000 square feet of which is leased but available for sublet, up from 730,000 feet in the fourth quarter), and 4.4 million square feet of space under construction (half of which is currently pre-leased). The vacancy rate for office space in San Francisco is currently 5.7 percent, which is down 20 basis points from the end of last year but expected to start ticking up and versus a long-term average of 9.4 percent.